Universal Credit is on its way - make sure you are ready with this handy guide. What Issues Can John Cryer Help You With? > Tax (but not council tax as this is set and paid to your local authority). > Hospitals and the National Health Service (not local social services). > Benefits, pensions, national insurance. > School closures and grants (not day-to-day school problems like governors or the local education authority). Should I contact someone else first? Some issues are not the direct responsibility of Parliament or government. In these instances, you should first contact either your local council or your nearest Citizens Advice Bureau before considering contacting your MP. > Private problems with neighbours, landlords, employers, family; or companies who've sold you faulty goods. > Decisions made by the courts. > Issues that are the responsibility of your local council, ie, dustbins or street repairs. > I acknowledge all emails from constituents. > I hold regular surgeries and visit elderly, disabled and other constituents at home if they have difficulty coming to see me. > I maintain a constituency office at 6 Gainsborough Road Leytonstone. > I keep constituents informed of my local and Parliamentary activities. Whilst I am unable to hold surgeries at my new office at 6 Gainsborough Road, I am now holding surgeries around the constituency. "I work in Parliament four days a week, holding the Government to account for the laws that affect my constituents' lives.Â So that I can represent them properly, I need to stay in touch with what they are thinking, and their hopes and aspirations.Â I usually keep Friday and the weekend as days for my constituency work, and I hold regular street surgeries around the constituency on Saturdays. However, I do often meet with local community groups and schools during the week and such groups often visit me in parliament. I receive hundreds of letters, phone calls, emails and visits every week.Â I send thousands of letters to constituents, companies, government agencies, the council and many other people and organisations on behalf of the people I represent.Â My professional staff works with me to chase up cases and ensure that my constituents are properly listened to and treated with respect. All I ask in return is that my staff are treated with courtesy and respect." As a Member of Parliament I process a large amount of personal data in the course of constituency casework and also in responding to policy enquiries. This policy explains the principles that govern how I look after that information and when and how I dispose of it. Since June 2018 we have been operating a paperless casework system. All incoming correspondence in all formats is saved to a secure, cloud-based casework database which requires a password and a time-limited access code to reach. 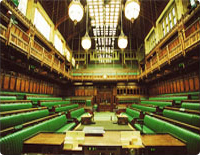 The cloud system itself is managed by an established company which provides this service to a majority of Members of Parliament. Letters saved to the system are immediately shredded after they have been uploaded. Electronic records will be retained indefinitely as they serve the useful purpose of providing us with anonymised statistical data about casework types. However you have the right of erasure and may ask us to delete all personal data about you from our systems if you so wish. This will be done as soon as is practically possible after we receive your request. You also have the right to request copies of all correspondence we hold on file about you, which again will be provided as soon as possible. Existing paper files, from before my office went paperless, are retained in a locked filing cabinet in our office. Files will be retained for a period of four years after the date of the last action or note and destroyed on the next convenient date thereafter. This applies to individual cases, of which an individual may have multiple. Only those cases which were last worked on four or more years ago will be destroyed. There is no duty to notify file holders of the destruction of old files but you may request old case files are forwarded to you at any time. Please email john.cryer.mp@parliament.uk if you wish to request your file at any time.